Last week the Bhumi Project hosted a meeting of pilgrim towns, cities and sites in Rishikesh as part of the Green Pilgrimage Network (India chapter). The meeting was co-hosted by the Alliance of Religions and Conservation (ARC) (www.arcworld.org) and the Ganga Action Parivar of Parmarth Niketan ashram in Rishikesh (www.gangaaction.com). 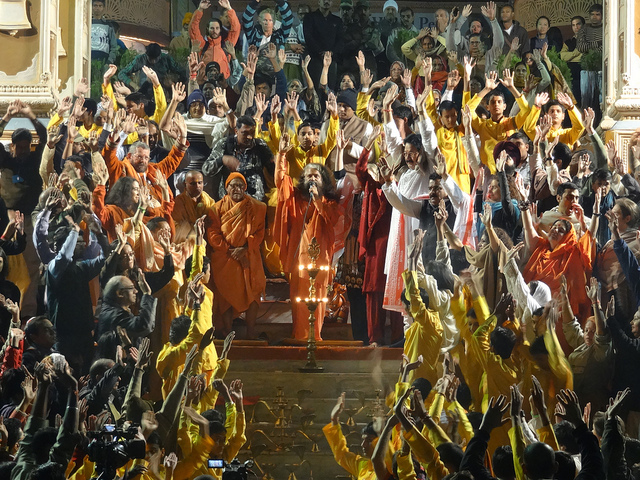 The meeting, on November 23 and 24, brought together representatives from the towns of Kolkata, Mayapur, Rishikesh, Sri Sailam, Varanasi, Vishakapatnam and Vrindavan. 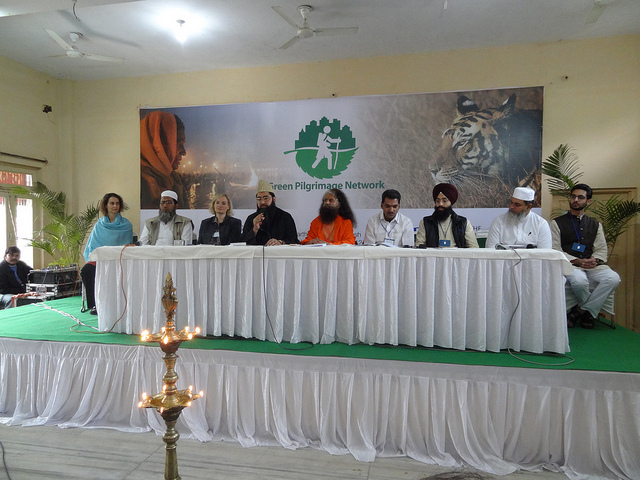 It also included key conservationists, including the head of Rajaji National Park and representatives of some of India’s most important tiger and wildlife reserves; a representative from ICLEI (www.iclei.org) to advise on sustainable city policy and faith leaders from different Hindu traditions. The discussion circled around how to make pilgrimage places greener, and the theologies, technologies and possibilities of this. 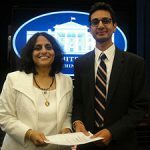 Solutions included: inaugurating a Hindu Environment Day (with an annual week of action and reflection); education and outreach; establishing green standards for pilgrimage cities and their temples; working out the future and outreach of an Indian network of green pilgrimage cities. The first morning opened with a welcome address by Pujya Swami Chidanand Saraswati of Parmarth Niketan. 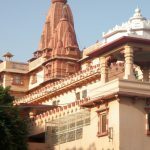 Speaking to the delegates, he expressed his pleasure at hosting them at his ashram and encouraging them to be the foundation of a new movement to preserving the sanctity of Hindu holy places. 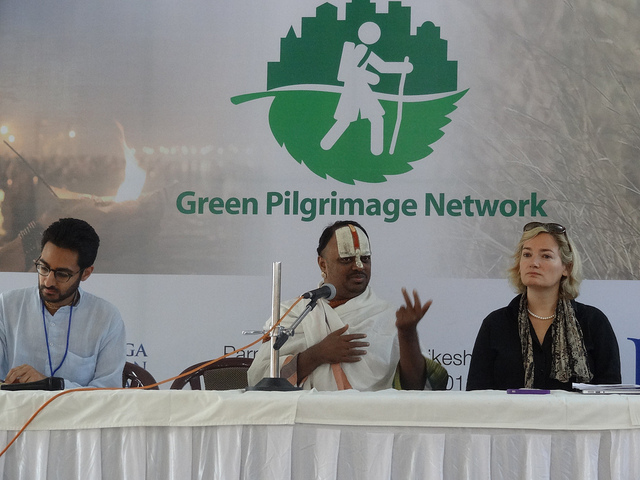 Pujya Swamiji is the inaugural chair for the Hindu members of the Green Pilgrimage Network. Day one was dedicated to highlighting some of the successes, challenges and opportunities in pilgrim towns. Jayanta Basu spoke of the annual Durga Puja in Kolkata. Since 2007 he has worked with city authorities to minimise the environmental impact of the festival. He highlighted some of the steps taken, such as awareness raising and using lead-free paints on the deities which are submerged into the River Ganges as part of the festival. Dr Rajendra Krishna shared the opportunities available for greening the Simhachalan temple in Vishakapatnam. 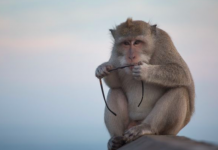 He spoke of the possibility of improving the environmental standards of the temple and surrounding areas and things they are already doing, such as using bio-degradable plates. 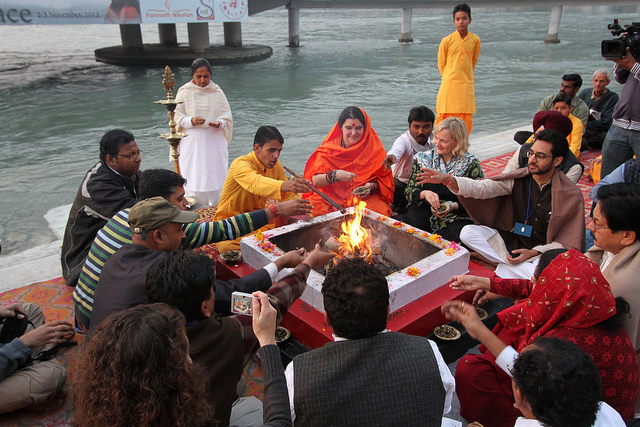 The first day closed with a special havan on the banks of the Ganges and a Ganga aarti led by Pujya Swamiji. The second day opened with an address by Sri Chaturvedi Swami, founder of the Sri Ramanuja Mission Trust. He spoke on the need for the development of good character if we are to make meaningful changes in the world. He also spoke of the Hindu view of the environment and it’s importance in the modern age. 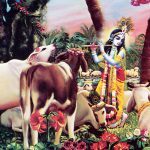 The introduction of an annual Hindu Environment Day (or Week) based around an appropriate existing Hindu festival or day. Pilgrimage shrines based near national wildlife parks to liaise with park authorities to cut down noise and light pollution and urgently find solutions for toilets and waste disposal. 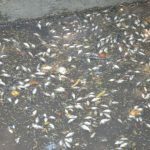 So many plastic bags are thrown around during pilgrimage (and at other times) that wild animals eat them and die in painful ways that are abhorrent to Hindu beliefs. 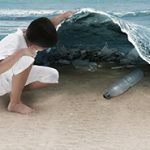 Finding realistic, affordable solutions for solid waste management – i.e. 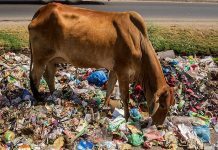 cleaning up the many tonnes of trash that amass in India’s sacred places, particularly at key festivals, when millions of pilgrims can arrive at one time. For the final session on the second day all delegates were asked to sign the international Green Pilgrimage Network vision statement. 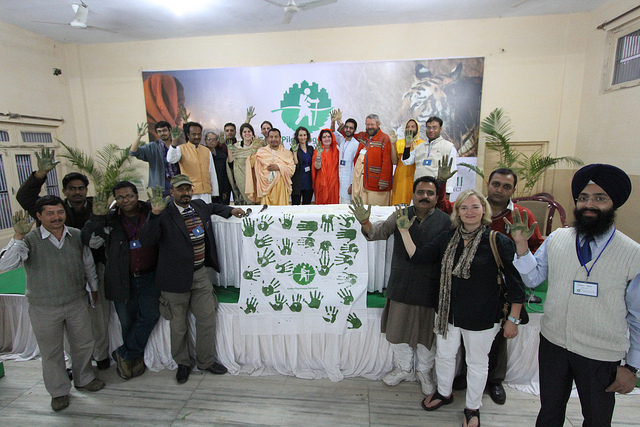 Each delegate then proceeded to place a green handprint on a specially-designed banner to mark their commitment. Work is now underway to begin implementation of the ideas suggested and develop resources for member cities. 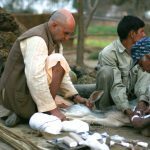 The Bhumi Project will also be present at the Kumbh Mela in Allahabad during January where we hope to host a week of events with Parmarth Niketan and other Indian partners.